Record Nations guides your organization through your entire document scanning project, from start to finish. Once all your files are indexed and scanned, the physical copies can either be placed in storage or securely shredded to keep your confidential information protected. Local service contractors around the country are partnered with Record Nations to bring you high-quality, mobile shredding services. Mobile shredding services are a secure and convenient option to shred away all your unwanted papers following a document scanning service. 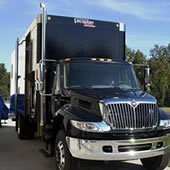 With mobile shredding, a truck equipped with an industrial shredder comes to your curbside. Your papers are shredded while you watch. Our professional handlers never come into any physical or visual contact with your papers to keep your information safe. The indecipherable remains are then transported to a recycling facility. You can also request a certificate of destruction to keep for your records. Record Nations is here to protect your information from data leaks and business identity thefts. Following your document scanning project, we can connect you with professional mobile shredding providers near you. To get started, fill out the form on the right or give us a call at (866) 385-3706. In just minutes, you will be contacted with free, no-obligation quotes from mobile shredding services in your area.